The proportions are up to you depending on which fruits you want more of or less of. 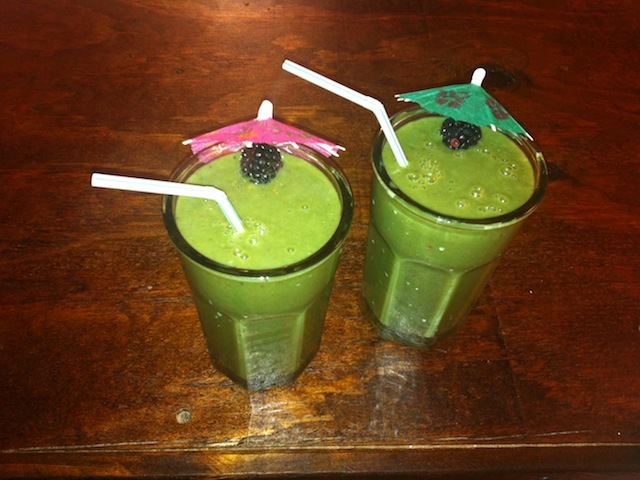 Start by throwing 2 handfuls of Spinach, half an Avocado 2 Bananas, a cup of fresh Pineapple Chunks, the juice of 1 Orange, a handful of Blackberries and the Flax//Chia//Super Green Medley into your blender. Next, pour Almond Milk in until it reaches a little over halfway through the blender. Last, add about 7-10 cubes of Ice. Blend for about 30 seconds or until smooth. Try a little bit, and if you desire a thinner smoothie, add more Almond Milk. If you desire a sweeter smoothie, add more Pineapple and Agave. For a creamier smoothie, add the other half of the Avocado. Serve cold and feel refreshed!